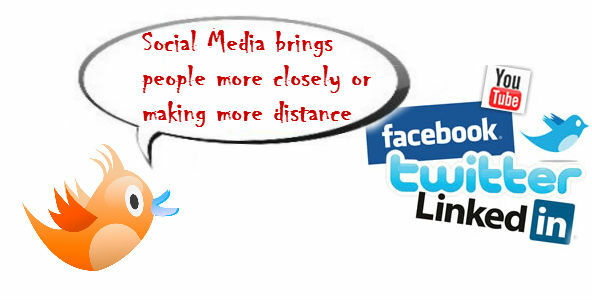 Do you think is social media bringing people together or making more distance between them? Addbucket » Tech » Do you think is social media bringing people together or making more distance between them? No doubt nowadays peoples are well connected with each other than ever before because of powerful social media. Billions of peoples are sharing their experience on face book, twitter, YouTube and many other social networks every day. If you ask this question to anyone that is social media bringing people together or making more distance between them? Majority of people will agree that people became closer to each other than ever before. Yes we agree with that answer but have we ever notice that we are making new making new friends and spending hours on the social media and in other hand people are spending lesser time with their own family who are living in same house. Don’t you think we are becoming more addictive of these smart devices? There are two different views of people for social media. Mostly youngsters, business peoples and who love to access the smart gadget they think social media is one of the best and powerful media for socialisation but there are few people who believe in the old traditional way is the best way for being touch with their close one. Both thoughts are true in their eyes and it will never end to justify whose thought is right and whose is wrong. So I leave with you to decide and please do not forget to leave your view on this page.